KOCHI: History repeated itself in the Hero Indian Super League as Atletico de Kolkata stunned Kerala Blasters FC 5-4 via tie-breaker to emerge champions in the third edition at Jawaharlal Nehru Stadium here on Sunday. 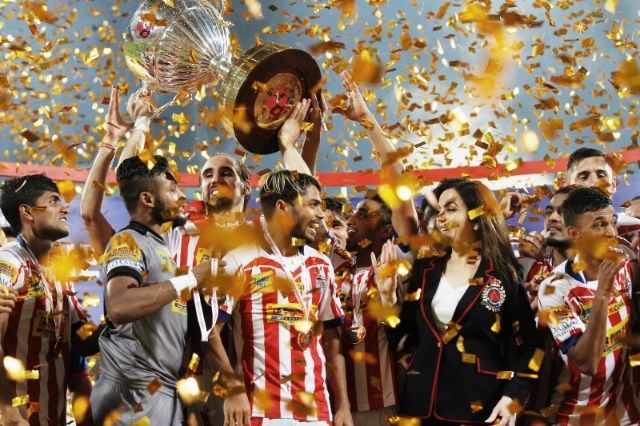 Atletico de Kolkata had defeated Kerala Blasters with a late winner to become champions in the inaugural edition in 2014 and two years later they left Kerala Blasters stunned in front of their packed home stadium to pocket the title for the second time in three years. It looked like Atletico de Kolkata would miss out on top honour after striker Iain Hume had missed his first penalty but ATK converted the next four penalties through Sameehg Doutie, Borja Fernandez, Javier Lara and Jewel Raja. Kerala Blasters converted their penalties through Antonio German, Kervens Belfort and Mohammed Rafique, while Elhadji Ndoye shot wide and captain Cedric Hengbart saw his final penalty being saved by goalkeeper Debjit Majumder. The teams were tied 1-1 at the end of regulation time after both struck in the opening 45 minutes. While Mohammed Rafi gave Kerala the lead in 37th minute, Atletico de Kolkata drew level through Henrique Sereno in 44th minute. The grand finale saw both teams maintaining a high tempo in the opening 45 minutes which meant they had enough chances to seize the initiative. Kerala Blasters had the first look at the rival goal in 10th minute when Helder Postiga lost the ball in midfield and Kervens Belfort launched a quick counter-attack. He got past his marker and pushed the ball to Rafi who tried to finish it off but his shot was blocked by a sliding rival defender. Rafi, however, was not to be denied again in the 37th minute when he leaped high to give Kerala Blasters the lead. Much of Kerala’s opening goal was down to poor marking from ATK but Rafi had done well to jump high, keep his cool and head a corner from Mehtab Hossain past ATK goalkeeper Debjit Majumder. Kerala were on the back-foot when their marquee player Aaron Hughes had to be substituted with an injury and it was clear they were missing his talismanic presence in central defence. In the 44th minute, his presence was badly missed as Atletico de Kolkata fought back and scored the equaliser also through a corner-kick as Henrique Sereno towered over everyone else to head a Sameehg Doutie corner. In the second session, the teams were watchful not to press too many men forward and as a result there were not many chances to pounce upon. Kerala Blasters coach Steve Coppell introduced Mohammad Rafique in the 77th minute to try and turn things around but the man who scored a late match-winner when the same teams clashed in an ISL final two years ago did not get any opportunity to grab the winner prompting the addition of another 30 minutes of extra time. The teams failed to break the deadlock even in extra time forcing the contest to be decided on penalties where Atletico de Kolkata proved to be better shooters.